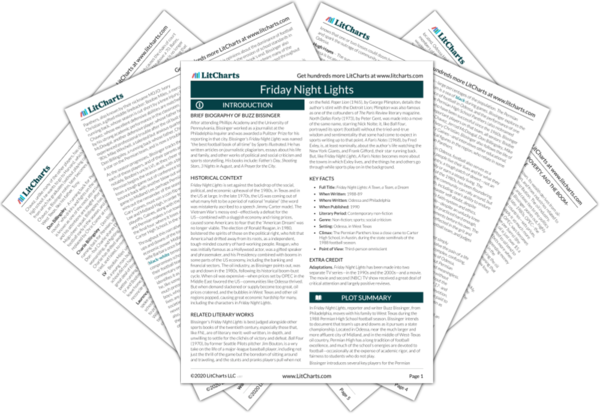 Welcome to the LitCharts study guide on Buzz Bissinger's Friday Night Lights. Created by the original team behind SparkNotes, LitCharts are the world's best literature guides. A concise biography of Buzz Bissinger plus historical and literary context for Friday Night Lights. A quick-reference summary: Friday Night Lights on a single page. In-depth summary and analysis of every chapter of Friday Night Lights. Visual theme-tracking, too. Explanations, analysis, and visualizations of Friday Night Lights's themes. Friday Night Lights's important quotes, sortable by theme, character, or chapter. Description, analysis, and timelines for Friday Night Lights's characters. Explanations of Friday Night Lights's symbols, and tracking of where they appear. An interactive data visualization of Friday Night Lights's plot and themes. After attending Phillips Academy and the University of Pennsylvania, Bissinger worked as a journalist at the Philadelphia Inquirer and was awarded a Pulitzer Prize for his reporting in that city. Bissinger’s Friday Night Lights was named “the best football book of all time” by Sports Illustrated. He has written articles on journalistic plagiarism, essays about his life and family, and other works of political and social criticism and sports storytelling. His books include: Father’s Day, Shooting Stars, 3 Nights in August, and A Prayer for the City. Friday Night Lights is set against the backdrop of the social, political, and economic upheaval of the 1980s, in Texas and in the US at large. In the late 1970s, the US was coming out of what many felt to be a period of national “malaise” (the word was mistakenly ascribed to a speech Jimmy Carter made). The Vietnam War’s messy end—effectively a defeat for the US—combined with a sluggish economy and rising prices, caused some Americans to fear that the “American Dream” was no longer viable. The election of Ronald Reagan, in 1980, bolstered the spirits of those on the political right, who felt that America had drifted away from its roots, as a independent, tough-minded country of hard-working people. Reagan, who was initially famous as a Hollywood actor, was a gifted speaker and phrasemaker, and his Presidency combined with booms in some parts of the US economy, including the banking and financial sectors. The oil industry, as Bissinger points out, was up and down in the 1980s, following its historical boom-bust cycle. When oil was expensive—when prices set by OPEC in the Middle East favored the US—communities like Odessa thrived. But when demand slackened or supply become too great, oil prices cratered, and the bubbles in West Texas and other oil regions popped, causing great economic hardship for many, including the characters in Friday Night Lights. Bissinger’s Friday Night Lights is best judged alongside other sports books of the twentieth century, especially those that, like FNL, are of literary merit: well-written, in-depth, and unwilling to settle for the clichés of victory and defeat. Ball Four (1970), by former Seattle Pilots pitcher Jim Bouton, is a wry take on the life of a major-league baseball player, including not just the thrill of the game but the boredom of sitting around and traveling, and the stunts and pranks players pull when not on the field. Paper Lion (1965), by George Plimpton, details the author’s stint with the Detroit Lion; Plimpton was also famous as one of the cofounders of The Paris Review literary magazine. North Dallas Forty (1973), by Peter Gent, was made into a move of the same name, starring Nick Nolte; it, like Ball Four, portrayed its sport (football) without the tried-and-true wisdom and sentimentality that some had come to expect in sports writing up to that point. A Fan’s Notes (1968), by Fred Exley, is, at least nominally, about the author’s life watching the New York Giants, and Frank Gifford, their star running back. But, like Friday Night Lights, A Fan’s Notes becomes more about the towns in which Exley lives, and the things he and others go through while sports play on in the background. Climax: The Permian Panthers lose a close came to Carter High School, in Austin, during the state semifinals of the 1988 football season. Adaptations. Friday Night Lights has been made into two separate TV series—in the 1990s and the 2000s—and a movie. The movie and second (NBC) TV show received a great deal of critical attention and largely positive reviews. Schlegel, Chris. "Friday Night Lights." LitCharts. LitCharts LLC, 17 Jun 2015. Web. 19 Apr 2019. Schlegel, Chris. "Friday Night Lights." LitCharts LLC, June 17, 2015. Retrieved April 19, 2019. https://www.litcharts.com/lit/friday-night-lights.